How do you pronounce Guy Savoy? I was educated by my bro on this. It's not English so...it's pronounced as Ghee Sav-wah. I know what you're thinking. My colleagues gave me bug-eyed looks when I mentioned the restaurant that I booked for our event's speakers. Anyway, we had an event at Marina Bay Sands last week so as to thank our speakers, moderators and masters of ceremonies, we had lunch at Guy Savoy where we ordered the "TGV" set lunch (S$55++ for 2 courses). Let the eating adventure begin! I don't know whether to call this an amuse bouche or just a treat. After we made our choices of starters and mains, the waiter handed each of us foie gras on crispy toast on a metal stick. Delightfully light and crispy, I then wondered whether I should've ordered the crab starter instead. Haha! This is the 'real' amuse bouche by the chef. It first came like this and had us all bewildered. I can see the paprika and what looks like minced cucumber and crab at the bottom of an interesting bowl/cup. 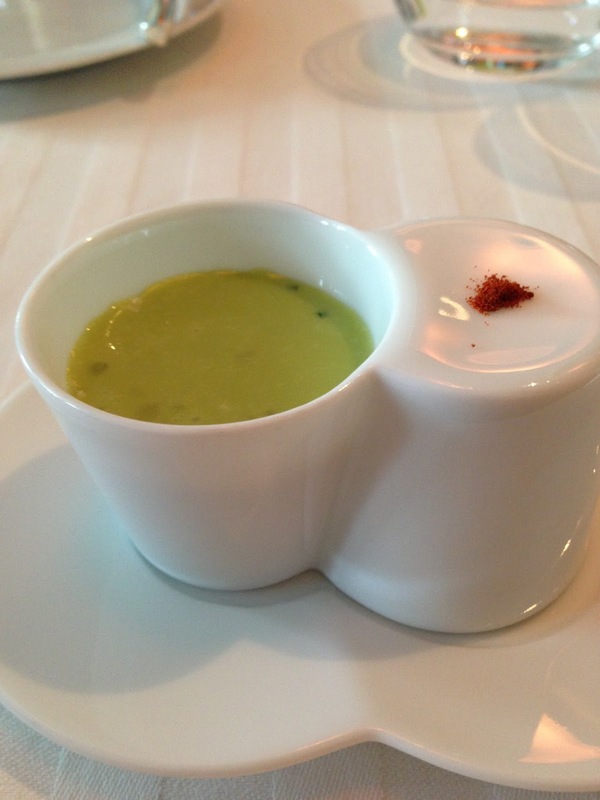 The magic was completed when the waiter poured chilled asparagus soup into our bowls and instructed us to push the paprika into the bowl before slurping it. When you lift the bowl, you'll discover a hidden dome of asparagus done in another way. Sorry about not taking a pic of that. Was too busy eating. All I could say is that I would not have known that it was asparagus if the waiter didn't mention so. For my starter, I chose the pan seared foie gras with potato roll. The original version came with horse radish but I requested mine without (you guys ought to know how much I detest horse radish by now). Two words to describe this dish - beautifully executed. That twirl and roll of potato is one continuous piece! It lightly absorbed the accompanying broth but yet managed to retain its flavour. Of course, the foie gras was pan seared to perfection. This dish was refined and elegant. It's Artichoke and Truffle soup and layered brioche with mushrooms and truffle cream. You could taste the woody, oaky flavours of the truffles and mushrooms in a warm, comforting soup. To remind you that this isn't your mother's concoction, the creaminess of the brioche adds that decadence that one expects in fine dining. For my main, I chose the Atlantic Cod with artichoke polvrade, barigoule aioli and summer condiment of sundried tomato and (I think) thin slices of freeze dried mushrooms. I quite liked the theatrics of bringing the whole darn fish to our table in the pot before slicing and plating. Although tasty, I feel that I could probably recreate this dish if I put my mind to it. The potatoes were nice. The artichoke was lightly acidic which cuts any fishy taste from the cod. I liked the texture of the condiments but otherwise, this was not a true party in the mouth. It's dressed like it's going clubbing but ended up at an Italian family restaurant. Oh...the petit fours! Too pretty to eat! I'm going to guess the exact names of the petit fours...first is the strawberry shortcake variation, coconut-marshmallow-like cube with fruit jam, chocolate dome and passion fruit macaron with chocolate filling. To end the wonderful meal, we were served a scoop of earl grey sorbet with black pepper cream. It was really yummy, which really surprised me because I'm not a huge fan of early grey since it has bergamot. Nonetheless, it is a lot nicer than eating lime sorbet and you could not taste the pepper in the cream. Delicious! The view from the restaurant is nothing to shout about (who cares about the casino?) when the true wonderful view is in front of you, in a plate.